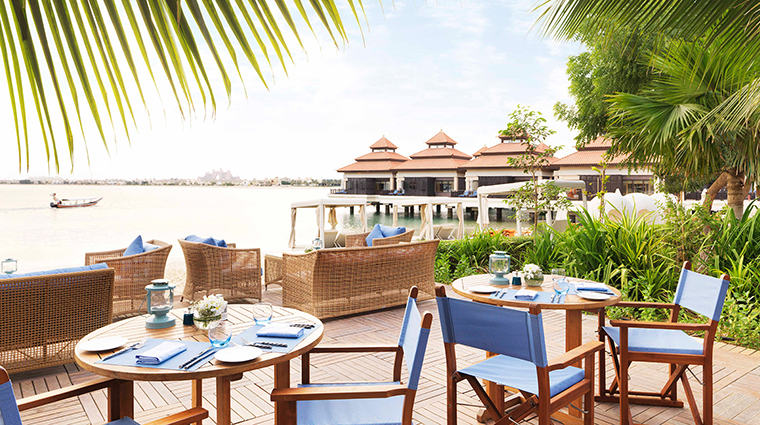 Located on the manmade Palm Jumeirah archipelago, Anantara The Palm Dubai Resort is an idyllic Thai-inspired escape, just 30 minutes from the city center. As soon as you set foot into the lobby, the urban bustle is left far behind. Your shoulders relax as you breathe in Oriental floral scents, listen to soothing music and sit on cane chairs under the wood-paneled roof, surrounded by lush plants. The only reminder that this is not, in fact, a forest retreat on a Thai island, is a glimpse of the hostess in a purple dress, holding an Arabian coffee pot and cup, ready to welcome you. Home to 293 rooms and villas, seven dining venues, infinity and lagoon pools, the sanctuary-like Anantara Spa, gorgeous views of the Arabian Sea and city coastline, and many one-of-a-kind wellness and leisure experiences, this Dubai hotel makes an excellent choice for rest and relaxation away from the buzzing city. Thai influences abound. Sail around the archipelago in the country’s only traditional longtail boat, explore the property in a colorful tuk-tuk or uncover the secrets of Thai cuisine with a cooking class at the Spice Spoons school. 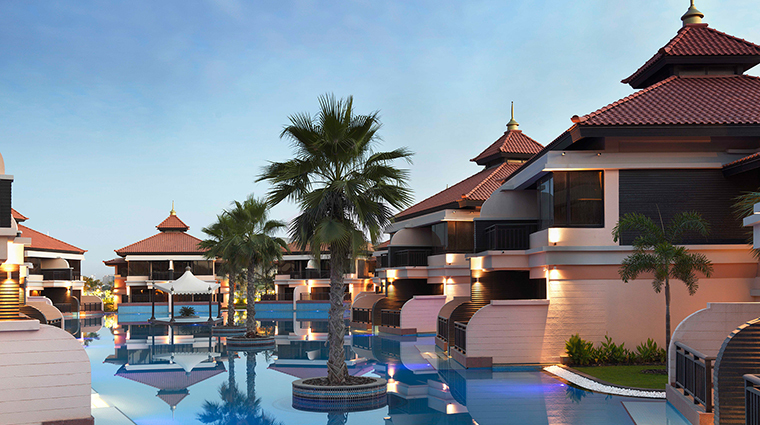 The beach resort is home to the only overwater villas in the UAE, some with a glass-floor panel. The villas are airy and spacious, with outdoor decks and sumptuous bathtubs affording fantastic views of the skyline across the sea. 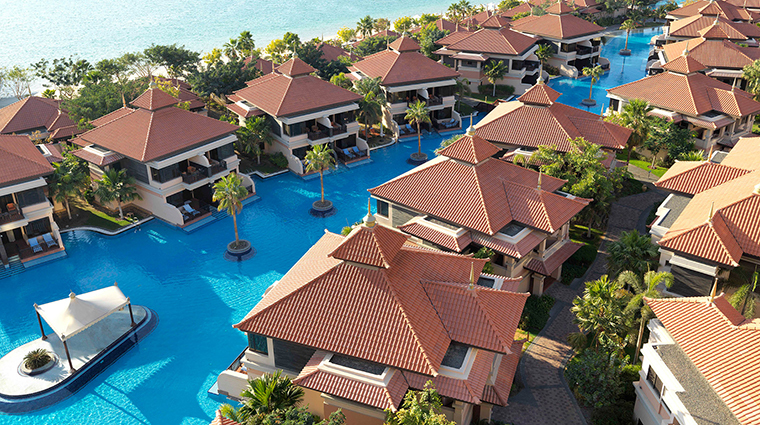 Beat the desert heat with a dip in one of the resort’s three lagoon pools or the main infinity pool. 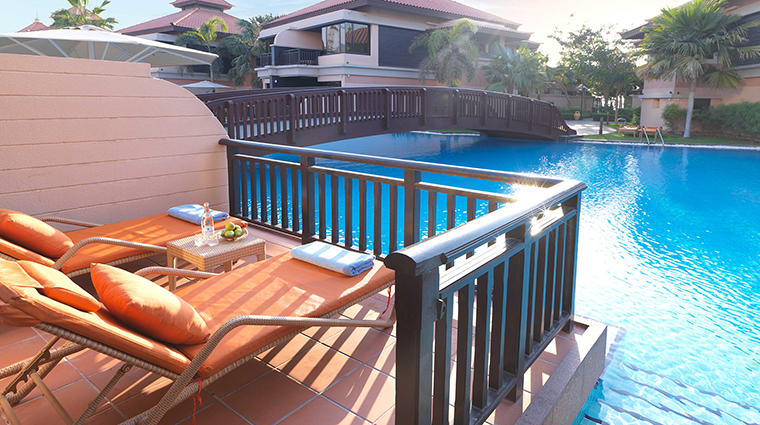 Or book your stay in the Beach Pool Villa for your own private oasis. 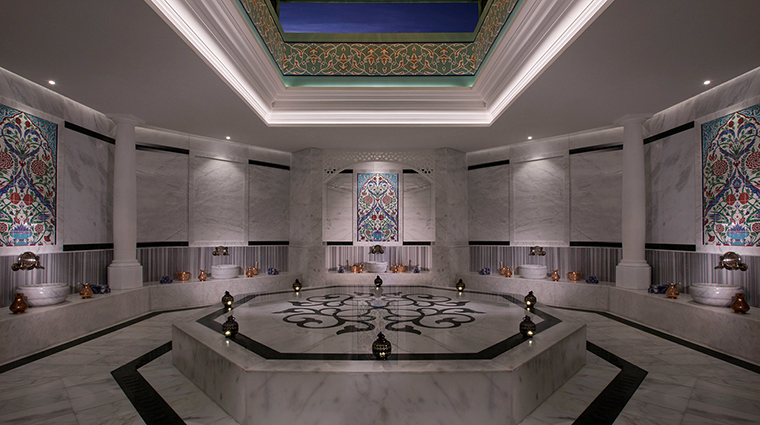 A treatment at the Anantara Spa is not to be missed. 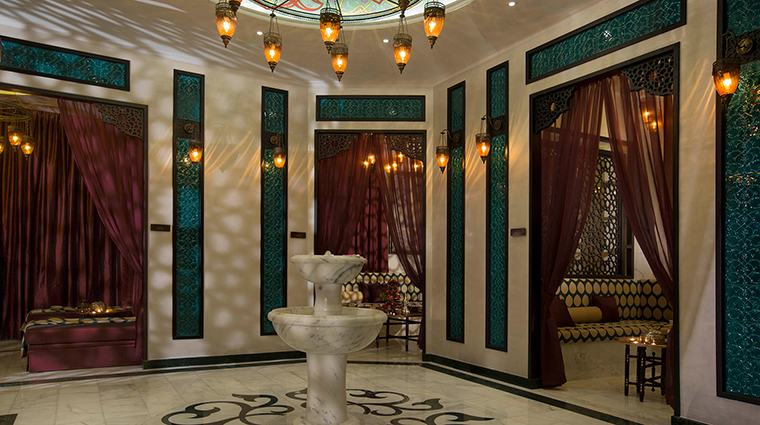 Try the traditional Turkish hammam, where you’ll be scrubbed clean on a heated marble slab before indulging in a foam bath. You’ll be spoiled for choice with no less than seven restaurants serving everything from Australian to Thai cuisine. The luxury hotel is a short drive from the mainland. You should be able to reach most areas of interest in 30 minutes or less by taxi. 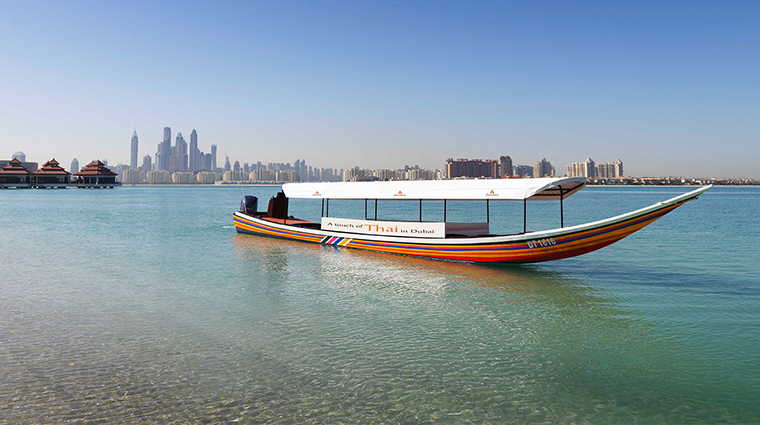 A taxi is the only way to get around, as the only other option for transportation on Palm Jumeirah is the privately owned monorail that does not stop within walking distance of the Anantara resort. The resort is ideal for families with children. There are kids and teens clubs and a plethora of aquatic activities, such as snorkeling, fishing, kayaking and banana boat rides. With Dining by Design, you can enjoy a romantic candlelit dinner under the stars on the beach, a private jetty or on your villa deck, with a customizable menu. Book weeks in advance for popular holidays like Valentine’s Day. 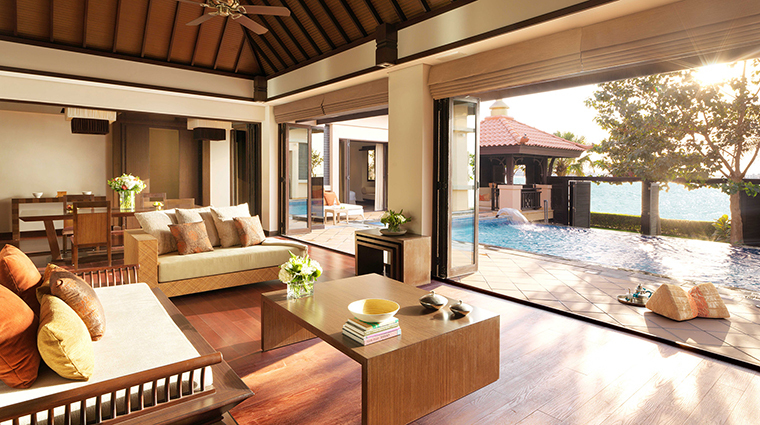 Rooms and villas are bright and airy, designed with a calming color palette of whites and earth tones. Dark woods with carved details and wood floors add a touch of stylish contrast. Large French windows open onto the private terrace overlooking the lagoons and gardens or the beach and let in abundant natural light. Bathrooms are spacious and come with double vanities, rain showers and bathtubs that often feature great sea vistas. 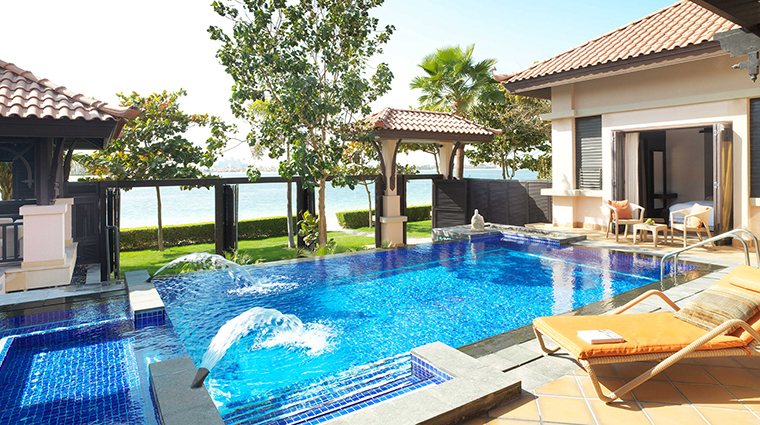 Beach Pool Villas provide direct access to the beach and private infinity pools. 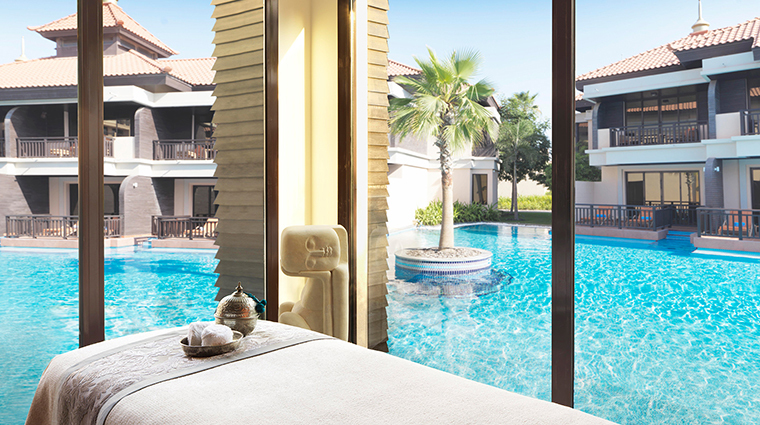 Take in the gorgeous views of the Arabian Sea or close the shutters for some secluded relaxation. Swim up to the poolside Mai Bar to cool off with a cocktail or stop by the trendy Revo Cafe for gourmet sandwiches, desserts, coffee and an extensive menu of detox juices. 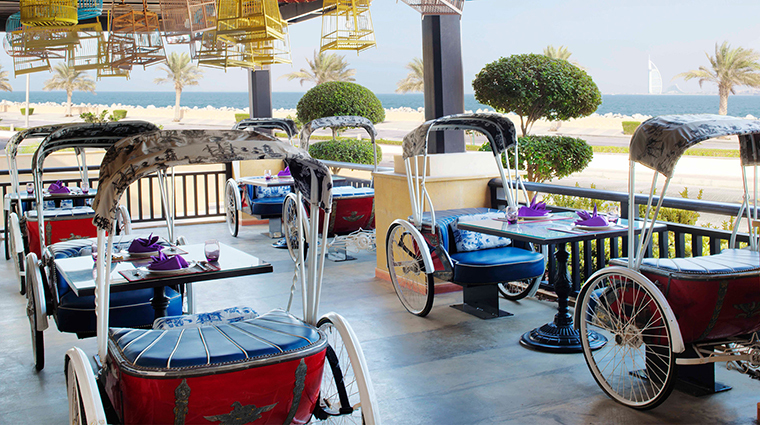 The Beach House does laid-back Mediterranean dining with a terrace that gets busy with shisha lovers in the evenings and during the winter. Try the grilled seafood platter. 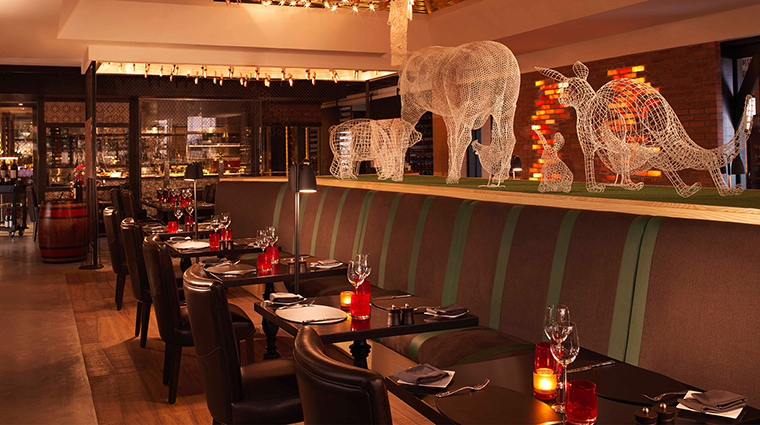 Dine at the Australia-themed Bushman’s Restaurant & Bar for regional specialties like kangaroo sirloin, grilled crocodile skewers, steaks and seafood in a rustic-chic setting. Open all day, Crescendo offers an array of international cuisines, live cooking stations and themed menus, such as French gourmet or Indian fare. If you’re visiting on a weekend, opt for the Fork & Cork Friday brunch. 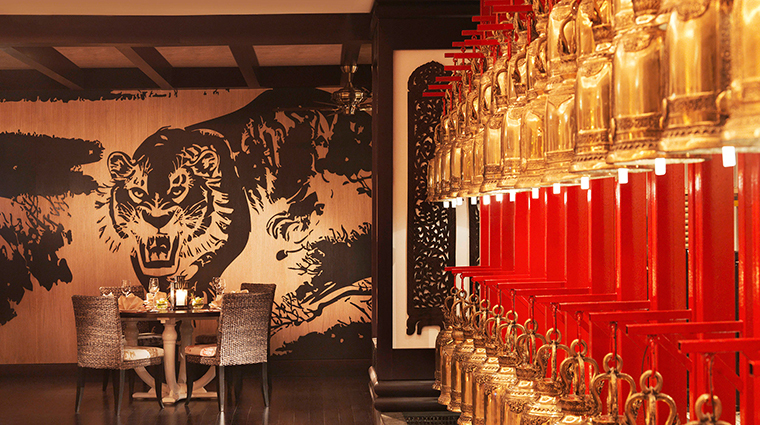 Mekong delivers an exceptional Asian dining experience with Oriental décor, rickshaw seating and design that channels the mysticism of the Far East. 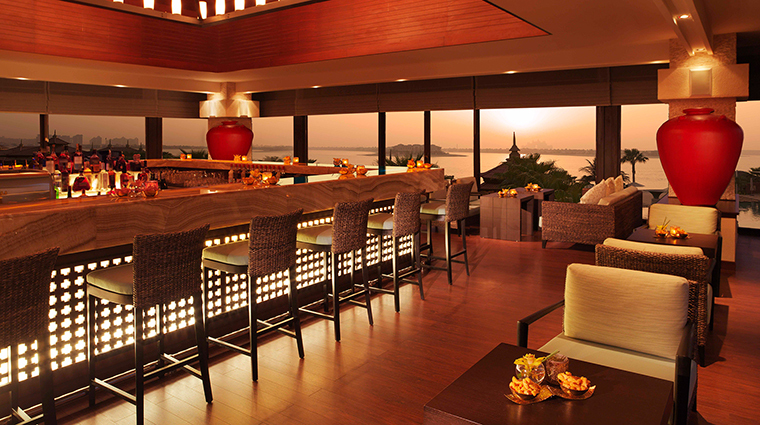 Among other Thai, Chinese and Vietnamese dishes, try the Mekong sharing platter and Beijing roasted duck.